For the new year, we're resurrecting one of our most popular early features: the Magpie of the Month! This January, we'll be featuring pieces worn by the Duchess of Cambridge, whose jewelry box has been growing by leaps and bounds since this blog began a few years ago. 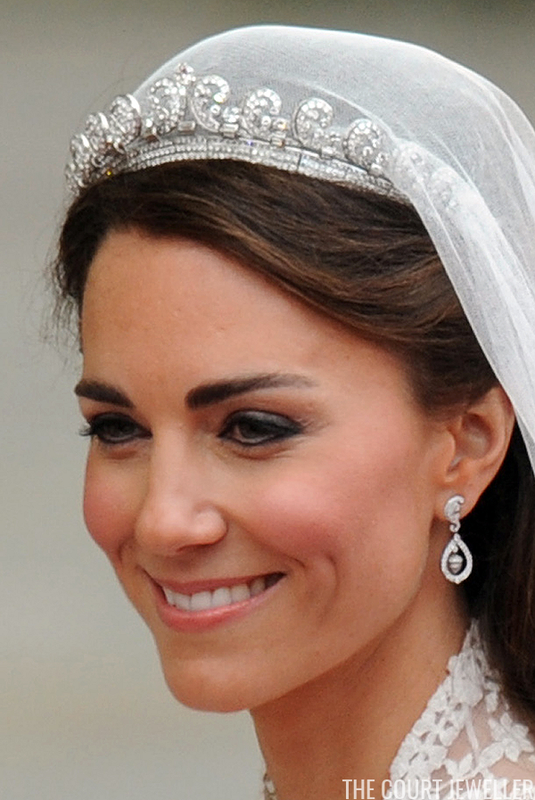 First up on the list: her bridal diadem, the famous Cartier Halo Tiara. The tiara is a relatively small, minor one, but it has always been in the main line of the British royal family. Made by Cartier in 1936, it was an anniversary gift from King George VI (then still Duke of York) to his wife, Elizabeth (who we all know better as the Queen Mum). She was photographed in the piece, which features large scroll elements arranged across a geometric band of diamonds (hence the fact that it is sometimes called the "Scroll Tiara"), but it never became one of her most frequently worn tiaras. 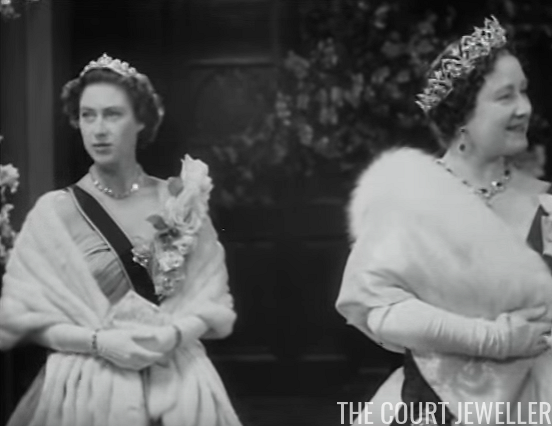 In 1944, Queen Elizabeth gave the tiara to her daughter, the current Queen, as an eighteenth birthday gift. However, Elizabeth II never wore the tiara in public. Instead, she loaned the piece frequently to her younger sister, Princess Margaret, who wore it at the 1953 coronation. The tiara really is the perfect size for a younger princess, and Margaret wore it often in the years before she married Antony Armstrong-Jones (when she graduated to something a touch bigger — the mighty Poltimore), as well as afterward. 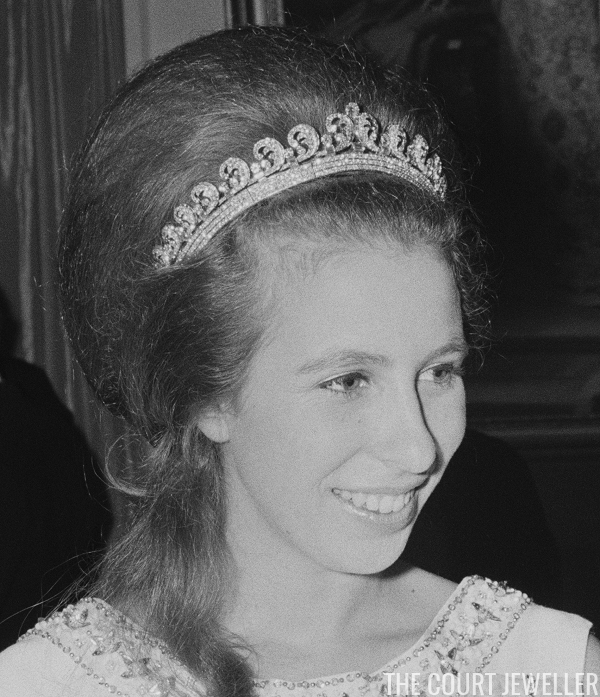 The next borrower of the tiara was the queen’s daughter, Princess Anne, who also wore the tiara frequently before her marriage. But then the tiara went into the vault, unseen for years until Kate Middleton arrived at Westminster Abbey for her royal wedding in 2011. Her choice of a bridal tiara is only one of the signals Kate has given in recent years that she wants her royal role to be patterned after that of the late Queen Mother. 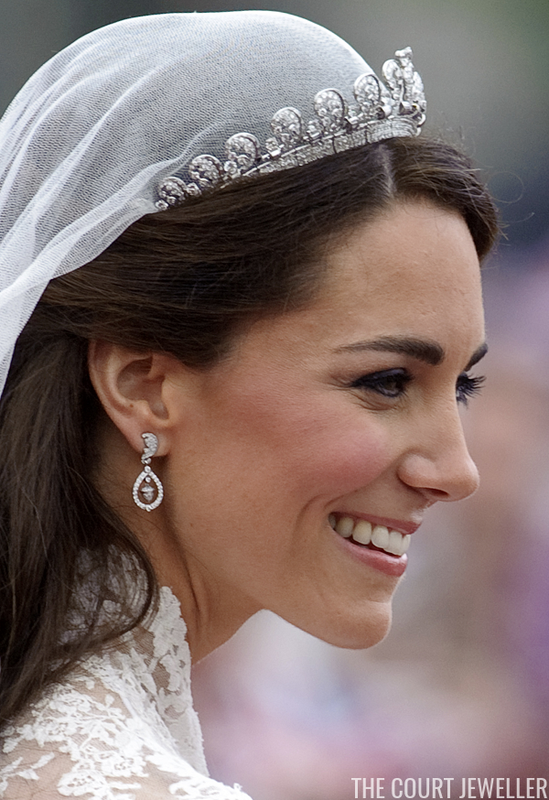 Kate also used another of her wedding jewels — her diamond earrings — to join together motifs from her birth and marital families. The main shape of the earrings mimics the scroll motif of the tiara, but the earrings also feature a diamond acorn, which comes from her father’s new coat of arms. We don’t know whether Kate has been loaned the tiara on a long-term basis, but the coordinating earrings made it seem highly likely that we will see her in it again someday. Note: This is an updated version of an earlier post, with new text and images.